Runtime: 2 hr. 41 mins. Harry Potter has not had a good summer. Not only has he had to put up with his overbearing Aunt Petunia and Uncle Vernon Dursley and their dread of his magical abilities, but also it seems as if Harry's best friends Ron Weasley and Hermione Granger have forgotten him, as they haven't replied to a single one of his letters. Then, suddenly and mysteriously, house-elf Dobby appears in Harry's bedroom and warns him of great danger if he should attempt to return to Hogwarts School of Witchcraft and Wizardry. But despite the elf's mischievous efforts to thwart Harry's return to school, the ever-determined Harry is rescued from the Dursley's dreary clutches by Ron and his brothers and whisked into the warmth of the Weasley household. Upon arriving at Hogwarts, Harry finds that his first year heroics have caused him to become the center of much unwanted attention. His new fans include Ron's little sister Ginny; first year would-be photographer Colin Creevey; and most irritatingly, the New Defense Against the Dark Arts Professor, Gilderoy Lockhart. Outshone only by his own vanity, Lockhart craves the attention that Harry shuns. But not even Lockhart can offer an explanation for the sinister new terror that is gripping the school. 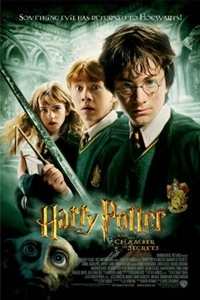 Harry Potter and his pals are back for their second year at Hogwarts School of Witchcraft and Wizardry, but things get a little dicey when students are suddenly turned into stone and a message on the school walls proclaims the Chamber of Secrets has been opened. What can it all mean? Just as the J.K. Rowling books keep getting better and more exciting, so do the movies based on them. Harry Potter and the Sorcerer's Stone had the unenviable task of introducing everything, but with Chamber of Secrets, you march right into the adventure headlong. After spending another miserable summer with the Dursleys, our boy Harry Potter (Daniel Radcliffe) is anxious to start his second year at Hogwarts, but a house elf named Dobby (voiced by Toby Jones) warns him he'll be in grave danger if he goes back. He returns anyway and sure enough, once Harry joins up with his friends Ron Weasley (Rupert Grint) and Hermione Granger (Emma Watson), weird things start to happen at school--one of which being that students are somehow being turned into stone. Pretty soon it becomes clear the Chamber of Secrets--a legendary hidden chamber of evil built by one of Hogwarts' founders, the nasty Salazar Slytherin--has been opened. Legend says the chamber can only be opened by the true heir of Slytherin, and once it is, the beast within will be unleashed to purge the school of those undeserving to study there. In other words, it'll get rid of wizards and witches who come from non-magic heritage (or Muggles, as they're called). This puts Hermione in particular danger since she comes from Muggle parents. Yikes. Harry has his hands full trying to figure this one out, especially since he is suspected as the one who opened the chamber. The natural rapport of the young actors Radcliffe, Grint and Watson comes shining through as the trio become more comfortable walking around in their characters' shoes. Radcliffe gets to do a lot more in Chamber of Secrets than just stand around wide-eyed and slack-jawed as he did in Sorcerer's Stone and all three have definitely improved as actors (but there is still some work to do). If you were to choose the best of the three, it would have to be Watson. She has a few truly outstanding moments, especially in her tender scene with Hagrid (the always good Robbie Coltrane) who tells her being Muggle-born has nothing to do with being a great witch. Great casting has also been a key element to the success of the Harry Potter movies, so the actors chosen to play the two new characters introduced in Chamber of Secrets are simply perfect. The delightful Kenneth Branagh has fun playing Prof. Gilderoy Lockhart, a vain blowhard who knows almost nothing about wizardry but pretends to, while Jason Isaacs (The Patriot) oozes as Lucius Malfoy, a malevolent wizard who was once a follower of You-Know-Who (Harry's nemesis Lord Voldemort. Oops! I said it). He is also father to bully Draco Malfoy, played by Tom Felton, who also needs a little more work in the acting department. Of course, watching the late Richard Harris as Hogwarts' headmaster Albus Dumbledore is indeed sad. It'll be hard to replace him. Chris Columbus just gets it. Either he somehow channels J.K. Rowling or perhaps is secretly part-wizard himself, but Columbus manages to capture the essence of the books to a tee. With Sorcerer's Stone, he was partially weighed down by the story's exposition but with Chamber of Secrets, he's set free. Columbus utilizes more special effects, darker imagery and plays up the funnier moments. If you are a fan of the books, you will marvel at Columbus' uncanny ability to visualize exactly what things looks like in Harry Potter's world. The digitally created house elf Dobby is just as you would imagine him, with torn clothes and huge eyes. As is the flying car, the walloping Whomping Willow, the creepy spiders' nest, the ugly baby Mandrake plant--all of it is done with exquisite detail. Still, the film is not completely perfect. Some moments don't ring as true, especially in the ending, and it runs a little long. If you aren't a literary follower, you might find yourself looking at your watch a few times during the course of the movie. But it's fleeting because soon you are caught up again by the next exciting chain of events. Columbus is passing the baton to director Alfonso Cuaron (Y Tu Mama Tambien) for the next Potter adventure, Prisoner of Azkaban, because he wants a break from all that magic stuff. I bet he'll miss it. They did it again. Harry Potter and the Chamber of Secrets surpasses Sorcerer's Stone as a crisper, more action-packed film, which will more than thrill the billions of Harry Potter fans everywhere. The film should reap the rewards handsomely.